like the day it came off the winder. The output level can exceed 8 volts peak, and when it finally distorts, the wave is shaped like triode overload, not fuzz. can be the solution to the ‘disappearing guitar’ effect you get sometimes on stage when you stomp on your distortion and sound weaker. 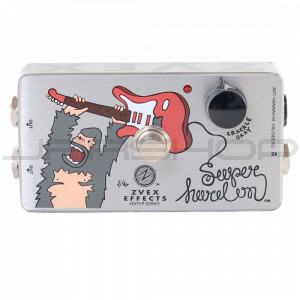 When cranked, it sounds much louder than a fuzz or distortion under stage conditions. boost level, you may hear a “POP!” when switching too. It goes away after a few switches. highest gain settings with an unusual guitar. power jack (standard Boss configuration with center negative) is provided on the side of the pedal. Use a high- quality 9V adaptor for all high-gain effects! email me your registration via the website! the website www.zvex.com for the most current information.